Elliotte Friedman of Sportsnet: Florida Panthers GM Dale Tallon will meet again later this month with Roberto Luongo to talk about his future. Around 70 percent of Joel Quenneville‘s $6 million salary this year will be covered by the Chicago Blackhawks. The remaining term with the Florida Panthers will start at $5.25 million and could get up to $7 million. If a bonus is reached, that number gets added to the next seasons’ salary. If the Buffalo Sabres offered Todd McLellan a lot of money, it would be surprising if the Los Angeles Kings matched. There were a number of teams watching Sabres defenseman Rasmus Ristolainen after the trade deadline. The 25-year old right-handed defenseman would get interest. Sabres GM Jason Botterill when asked if they’d trade their first-round pick. Among the people who could interest in the Edmonton Oilers as a potential GM could include Mike Gillis, Mike Futa, Keith Gretzky, Mark Hunter, Kelly McCrimmon, Bill Zito – maybe Sean Burke, Bill Armstrong. Possibly not Ron Hextall and Ron Francis may not be available. People who are believed to have said no to the Ottawa Senators – Francis, Trevor Linden, Dean Lombardi, Joe Nieuwendyk and Steve Yzerman. Potential Glen Sather replacements with the New York Rangers – John Davidson and Yzerman. Vancouver Canucks GM Jim Benning on if re-signing defenseman Alex Edler his more difficult than he expected. 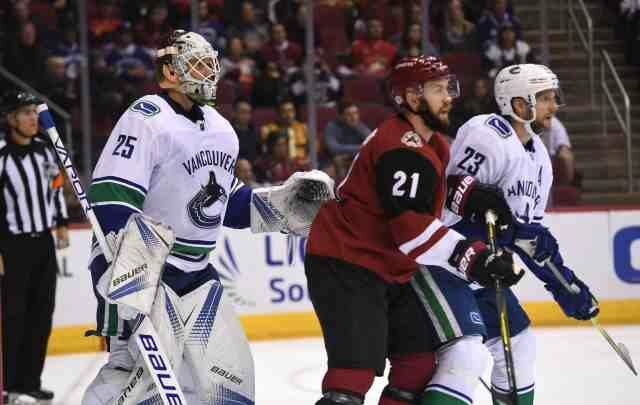 Benning will talk to Jacob Markstrom about a contract extension. The Montreal Canadiens may have interest in KHL forward Konstantin Okulov. Okulov has a year left on his contract.